I’ve seen some puzzling messages from Google Voice’s transcription, but this attempt to translate an automated reminder to pay my cable bill left me really scratching my head. After listening to the message (embedded below), it turns out it was attempting to transcribe in English what the automated attendant was saying in Spanish. Hello, this is Time Warner your cable television telephone internet provider. We need to speak to you regarding an important business matter that will affect your services. Please call our office at (972) 742-5892. Thank you for choosing Time Warner Cable, but I have left Time Warner Cable sleep over those become. That it with you on that. If I’m not eating it.This is the telephone. I posted room. We’ve put that the Catholic that’s so if you can. So if I wanna call me because I color stuff. If you know in a little bit of 20 point lead to get those. 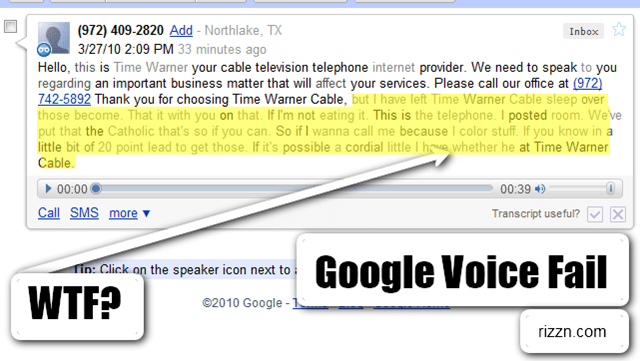 If it’s possible a cordial little I have whether he at Time Warner Cable. There has to be a repository for these somewhere. I've seen way to many funny transcriptions so far. voicetotextfail.com has started to collect these….